"El Ángel" redirects here. For the wrestler, see El Ángel (wrestler). For the film, see The Angel (2018 Argentine film). El Ángel was built in 1910 during the presidency of Porfirio Díaz by architect Antonio Rivas Mercado, to commemorate the centennial of the beginning of Mexico's War of Independence. In later years it was made into a mausoleum for the most important heroes of that war. It is one of the most recognizable landmarks in Mexico City, and it has become a focal point for both celebration or protest. It resembles the July Column in Paris and the Berlin Victory Column in Berlin. On the main face of the base facing downtown Mexico City, there is an inscription reading La Nación a los Héroes de la Independencia ("The Nation to the Heroes of Independence"). In front of this inscription is a bronze statue of a giant, laureled lion that guides a child, which symbolizes, according to Rivas Mercado, "the Mexican people, strong during War and docile during Peace." Next to the column there is a group of marble statues of some of the heroes of the War of Independence. The column itself is 36 metres (118 ft) high. The structure is made of steel covered with quarried stone decorated with garlands, palms and rings with the names of Independence figures. Inside the column is a two-hundred step staircase which leads to a viewpoint above the capital. The Corinthian-style capital is adorned by four eagles with extended wings from the Mexican coat of arms used at the time. Crowning the column there is a 6.7 metres (22 ft) statue by Enrique Alciati of Nike, the Greek goddess of Victory, like other similar victory columns around the world. It is made of bronze, covered with 24k gold (restored in 2006) and weighs seven tons. In her right hand the Angel, as it is commonly known, holds a laurel crown above Miguel Hidalgo's head, symbolizing Victory, while in her left she holds a broken chain, symbolizing Freedom. Construction of El Ángel was ordered in 1900 by President Porfirio Díaz. Antonio Rivas Mercado began the foundation work immediately and laid the foundation stone on January 2, 1902 and placed in it a gold chest with a record of independence and a series of coins minted in that epoch. But in May 1906, when the foundations were built and 2,400 stones placed to a height of 25 m, the sides of the monument collapsed, so Díaz created a study commission composed of engineers Guillermo Beltran y Puga, Manuel Marroquín y Rivera and Gonzalo Garita. The commission determined that the foundations of the monument were poorly planned, so it was decided to demolish the structure. The work was restarted under the supervision of a steering committee composed of engineers Guillermo Beltran y Puga, Manuel Marroquin y Rivera and the architect Manuel Gorozpe, leaving the artwork in the care of architect Antonio Rivas Mercado. All the sculptures were made by Italian artist Enrique Alciati. One of the faces in the doors is of one of Rivas Mercado´s daughter, Antonieta. The monument was completed in time for the festivities to commemorate the first hundred years of Mexican Independence in 1910. The opening ceremony was attended by President Díaz and several foreign dignitaries. The main speaker at the event was Mexican poet Salvador Díaz Mirón. An eternal flame (Lámpara Votiva) honoring these heroes was installed in the base of the column at the order of President Emilio Portes Gil in 1929. The monument suffered some damage during an earthquake on July 28, 1957 when the sculpture of the Winged Victory fell to the ground and broke into several pieces. Sculptor José Fernández Urbina was in charge of the restoration, which lasted more than a year. The monument was reopened on September 16, 1958. It survived the devastating earthquake of September 19, 1985 with some damage to the staircases and the reliefs, but none to the Angel. The monument lit at night with color changing LED light. The Independence Angel on the Paseo de la Reforma, at sunset. In 1925, during the administration of Plutarco Elías Calles, the remains of the following Heroes of the Mexican Independence were interred in a mausoleum under the base of the monument. At the entry to the mausoleum is a statue of William Lamport, also known as Don Guillén de Lampart y Guzmán, an Irishman who was tried by the Mexican Inquisition in the mid seventeenth century, following the discovery of his plot to achieve the independence of New Spain. He was released by the inquisition to secular authorities and executed in the auto de fe of 1659, with his remains forbidden burial in sacred ground. Father Miguel Hidalgo y Costilla: Chief instigator of independence in 1810 and "Father of the Nation". Father José María Morelos y Pavón: Skilled general and leader of the independence movement after Hidalgo's execution. Ignacio Allende: Lieutenant general of the insurgent army and later rebel leader. Juan Aldama: A rebel captain and conspirator. José Mariano Jiménez: Hidalgo's lieutenant colonel. Guadalupe Victoria: Commander of the insurgent army and first President of Mexico. Vicente Guerrero: Insurgent general following the death of Morelos and second President of Mexico. Nicolás Bravo: Commander of the rebel army and later President of Mexico on three occasions. Mariano Matamoros: A priest who served as Morelos's lieutenant general. Andrés Quintana Roo: A prominent constitutionalist. Leona Vicario: Active supporter of the rebel movement and wife of Andrés Quintana Roo. Francisco Javier Mina (Xavier Mina): A Spanish officer who joined the rebel cause against the absolute monarchy of Ferdinand VII. Absent from the mausoleum is Agustín de Iturbide, who achieved Mexico's independence from Spain in 1821; his remains are in the Metropolitan Cathedral of Mexico City. President Calles excluded Iturbide when other insurgents' remains were transferred to the mausoleum in 1925. More than 60 years after the mausoleum was erected, on September 16, 1998 it was permanently opened to the public by President Ernesto Zedillo and Cuauhtémoc Cárdenas, Head of Government of the Federal District. On May 30, 2010, as part of the Bicentennial celebrations of the War of Independence, the remains of the National Heroes were exhumed and then escorted by the Armed Forces with full military honors to the National History Museum in Chapultepec Castle, where they were subject of studies by members of the National Institute of Anthropology and History. After these studies, the remains were temporarily exhibited at the National Palace until August 2011, when they were returned to the mausoleum. Visitors are allowed to enter the monument, view the memorial plaques at the base level, and climb to the top of the tower. Entrance is free. To go up people must get a permit at the Cuauhtémoc borough where you must show ID. Groups of no more than 6 are then allowed into the monument for about 15 minutes. There are 200 stairs, and the climb is arduous. The first approximately 15 stairs, in the base, are wide and comfortable. The stairs in the column itself, approximately 185, are circular, metal, very narrow and without a landing or resting point until one reaches the top. Visitors who are not in good physical shape will find the climb exhausting—it is the equivalent of climbing a 14 story building in one go, and those not comfortable with tight spaces should avoid the climb as there is insufficient room to allow others to bypass. Some areas of the staircase are very dark, and there are only a few slits to let in light. The top balcony, though narrow, offers a commanding view of the wide avenues that surround the column. The return trip down is by way of the same circular staircase. More recently El Ángel has become the traditional gathering place for celebration by Mexico City inhabitants, particularly following Mexico national football team victories and as a focal point for political rallies. As of March 2016, visiting inside is limited to Saturdays and Sundays from 10:00 AM to 1:00 PM. ^ Zorrilla, Begoña (August 2010). "El Ángel de Independencia". Mexicanísimo. 30: 53. ^ Thomas Benjamin, La Revolución: Mexico's Great Revolution as Memory, Myth, and History. Austin: University of Texas Press 2000, pp. 184-85, footnote 30. 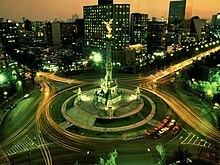 ^ "Trasladan restos de héroes a Chapultepec" (in Spanish). El Universal. Retrieved 30 May 2010. Baird, David; Bairstow, Lynne (2004). Frommer's Mexico 2005. Wiley Publishing, Inc. ISBN 0764567632. Blair, Kathryn Skidmore (2001). In The Shadow of The Angel. First Books. ISBN 0759606315. Wikimedia Commons has media related to Monumento a la Independencia. Picture of el Ángel at sunset. Paseo de la Reforma is a wide avenue that runs diagonally across the heart of Mexico City. It was designed by Ferdinand von Rosenzweig in the 1860s and modeled after the great boulevards of Europe, such as the Ringstraße in Vienna and the Champs-Élysées in Paris. After the French intervention in Mexico overthrew the constitutional President Benito Juárez, the newly crowned Emperor Maximilian made his mark on the conquered city. 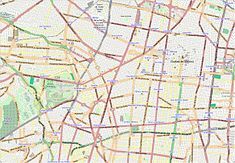 He commissioned a grand avenue linking the city center with his imperial residence, Chapultepec Castle, which was then on the southwestern edge of town. The project was originally named Paseo de la Emperatriz in honor of Maximilian's consort and second cousin Empress Carlota. After her return to Europe and Maximilian's subsequent execution, the restored Juárez government renamed the Paseo in honor of the Reform War. The Cry of Dolores is a historical event that occurred in Dolores, Mexico, in the early morning of 16 September 1810. 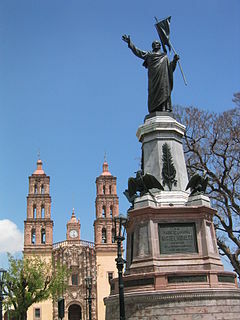 Roman Catholic priest Miguel Hidalgo y Costilla rang the bell of his church and gave the pronunciamiento that triggered the Mexican War of Independence. José María Teclo Morelos Pérez y Pavón was a Mexican Roman Catholic priest and revolutionary rebel leader who led the Mexican War of Independence movement, assuming its leadership after the execution of Miguel Hidalgo y Costilla in 1811. Morelos and Ignacio López Rayón are credited with organizing the war of independence. Under Morelos the Congress of Anáhuac was installed on September 13, 1813 and in November 6 of the same year congress declared the country's independence. On October 22, 1814 a constitution, Decreto Constitucional para la Libertad de la América Mexicana, was drafted by the Congress which declared that Mexico would be a Republic. Ignacio López Rayón was a general who led the insurgent forces of his country after Miguel Hidalgo's death, during the first years of the Mexican War of Independence. He subsequently established the first government, Zitacuaro Council, and first constitution, Constitutional Elements, of the proposed independent nation. Enrique Alciati was a French/Italian sculptor and teacher, born in Marseille, France, who contributed various sculptures in France and Mexico. His most notable artwork is the Winged Victory that crowns the Independence Column in downtown Mexico City. Juan Aldama was a Mexican revolutionary rebel soldier during the Mexican War of Independence in 1810. The Alhóndiga de Granaditas is an old grain storage building in Guanajuato City, Mexico. This historic building was created to replace an old grain exchange near the city's river. The name Alhóndiga translates roughly from both Arabic and Spanish as grain market or warehouse. It is equivalent to the regional grain exchange. Its construction lasted from 1798 to 1809, by orders of Juan Antonio de Riaño y Bárcena, a Spaniard who was the quartermaster of the city during the Viceroyalty of New Spain. Miguel Hidalgo y Costilla helped build it. The building received World Heritage listing as part of the Historic Town of Guanajuato in 1988. Félix María Calleja del Rey y de la Gándara was a Spanish military officer and viceroy of New Spain from March 4, 1813, to September 20, 1816, during Mexico's War of Independence. For his service in New Spain, Calleja was awarded with the title Count of Calderon. The Monument to the Revolution is a landmark and monument commemorating the Mexican Revolution. It is located in Plaza de la República, near to the heart of the major thoroughfares Paseo de la Reforma and Avenida de los Insurgentes in downtown Mexico City. The Battle of Temalaca was a battle of the War of Mexican Independence that occurred on 5 November 1815 in the area around Temalaca, Puebla. The battle was fought between the royalist forces loyal to the Spanish crown and the Mexican rebels fighting for independence from the Spanish Empire. The Mexican insurgents were commanded by José María Morelos and the Spanish by Manuel de la Concha. The battle resulted in a victory for the Spanish Royalists. The Battle of Tecualoya was a military action of the Mexican War of Independence fought between 17–20 January 1812 in the canyons of Tecualoya, Mexico. The battle was fought between the royalist forces loyal to the Spanish crown and the Mexican rebels fighting for independence from the Spanish Empire. The Mexican insurgents were commanded by General Hermenegildo Galeana and the Spanish by Rosendo Porlier y Asteguieta. The battle resulted in a victory for Spanish loyalists. The Battle of Tenancingo was a military action of the Mexican War of Independence fought on 22 January 1812 on the outskirts of Tenancingo de Degollado, Mexico. The battle was fought between the royalist forces loyal to the Spanish crown and the Mexican rebels fighting for independence from the Spanish Empire. The Mexican insurgents were commanded by General José María Morelos y Pavón and the Spanish by Rosendo Porlier y Asteguieta. The battle resulted in a victory for the Mexican rebels. El Siege of Huajuapan de León was a battle of the Mexican War of Independence that was fought from 5 April to 23 July 1812 at Huajuapan de León, in the Mexican state of Oaxaca. The battle was fought between the royalist forces loyal to the Spanish crown, and the Mexican rebels fighting for independence from the Spanish Empire. This Spanish siege of the town, lasting 111 days, was the longest of the entire war. The battle resulted in a victory for the Mexican insurgents. The Battle of Zitlala was a battle of the War of Mexican Independence that occurred on 26 October 1812 in the area around Escamela, Ixtaczoquitlán, Veracruz. The battle was fought between the royalist forces loyal to the Spanish crown, and the Mexican rebels fighting for independence from the Spanish Empire. The battle resulted in a victory for the Mexican rebels. The Siege of Acapulco was a battle of the War of Mexican Independence that occurred on 12 April 1813 at Acapulco de Juárez. The battle was fought between the royalist forces loyal to the Spanish crown, commanded by Pedro Antonio Vélez, and the Mexican rebels fighting for independence from the Spanish Empire, commanded by José María Morelos. The battle resulted in a victory for the Mexican rebels. The Monument to Cuauhtémoc is an 1887 statue dedicated to the last Mexica ruler (tlatoani) of Tenochtitlan Cuauhtémoc, located at the intersection of Avenida de los Insurgentes and Paseo de la Reforma in Mexico City. It is the work of Francisco Jiménez and Miguel Noreña in the "neoindigenismo", and was proposed to promote the new government of Porfirio Diaz. The Zitacuaro Council, also known under a variety of names such as the Supreme National American Meeting or Supreme Governmental Board of America, was a council established by insurgent leaders Ignacio López Rayón and José María Morelos, along with minor members José María Liceaga and José Sixto Verduzco, which would serve as a prototypical government independent of the Spanish crown.